It’s been a long tiring day. After coming home from office always thoughts come to mind as to what to cook for dinner. It has to be something easy , something which does not consume much time. Since I had soaked chick-peas the previous night, I thought of preparing Cholay Masala in a very easy way. I also prepare Pindi Chana which is yummier. Soak chick-peas overnight or for 6 hrs. Boil them and keep aside. In a frying pan, fry chopped onions. When onions turn pinkish, add garlic and ginger and fry for 2 Min’s. Then add chopped tomatoes and fry. While frying, always use low flame and cover the lid. When tomatoes emit little water add turmeric powder and garam masala. Switch off the gas and let this cool. After cooling, grind into a paste. Mix this paste into the boiled chick-peas. Add water as per your choice. I suggest not to add too much water, as the gravy will become watery. Then add kasuri methi and stir. WOnderful blog u have, cholay masala looks super delicious and inviting..
Looks very inviting n delicious too.. Thanks Archana, kalpana, Reva, Reshmi, Umm Mymoonah, Sushma, Sarah and Priya. Cholae masala looks delicious, thanks for visiting my blog. You have nice space to. first time here..u have a lovely space with some great dishes…best wishes. 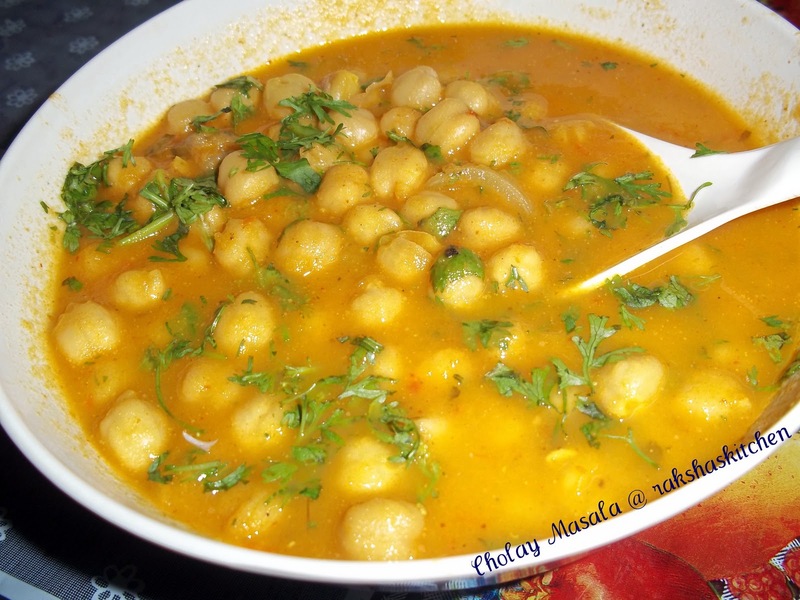 Chole masala looks delicious and yummy..perfect with pooris. Hey Raksha , one more tip , when you are soaking the cleaned chickpeas, soak them in Tea water( 4 cups water and 1 tbsp tea powder and strain the water thats the tea water). Next morning cook the chickpeas in the same water and add tureric powder and salt. Will add flavour to your chole masala. I hardly ever get my chole masala in a curry – always turns out dry. Will defintely try this way.